When we lost our baby, one of the first things I wanted to do was create a space for Sahar here at home. I’ve posted about it a few times already and I’m still working on it every single day. But it’s not only healing to create a space for your baby at home, it’s also very healing to create a space for ourselves. I felt I needed a space for me, a space for my husband, a space for us. A space to bring us hope, something to soothe our pain, a space where we can nurture our dreams. I did this and wanted to share this experience here with you. 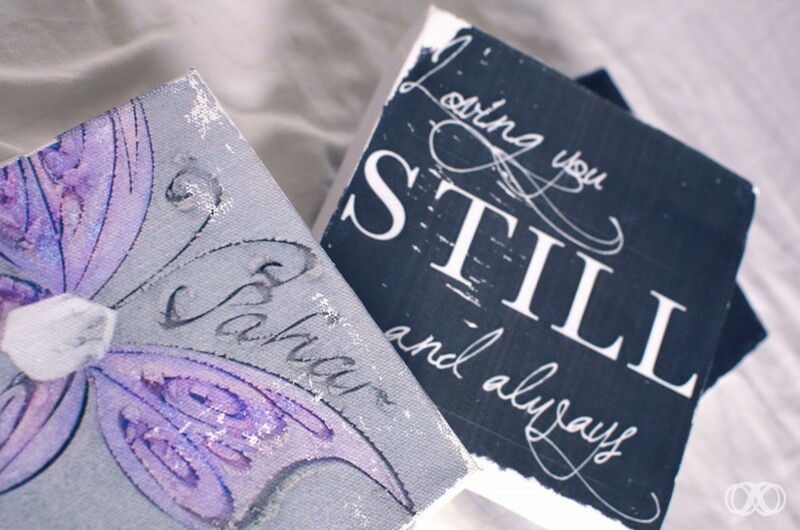 I ran into Franchesca’s work at Small Bird Studios and I immediately fell in love with the beautiful canvasses she makes. 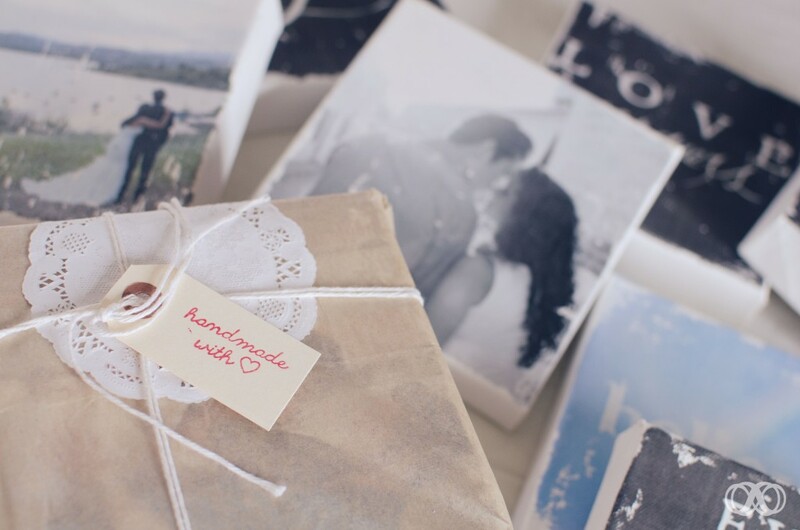 With the “Tell your story”-package you can actually create a set of canvasses that transmit a feeling, a sensation, a message… And then this great idea was born. I started looking for images and quotes that I wanted to use to create a feeling of trust, hope, healing, belief and peace. Soon I was ordering my very own set, and the result is breathtaking. I event felt sorry opening that beautiful wrapping! 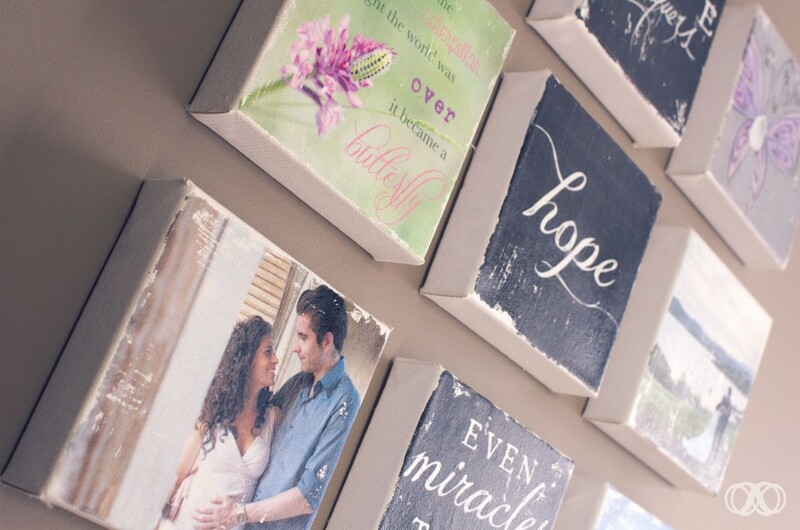 These canvasses hang in the private space of our bedroom. It’s the first thing we see every single morning when we wake up. It’s the last thing we see every night when we go to sleep. I visit it whenever I feel down. 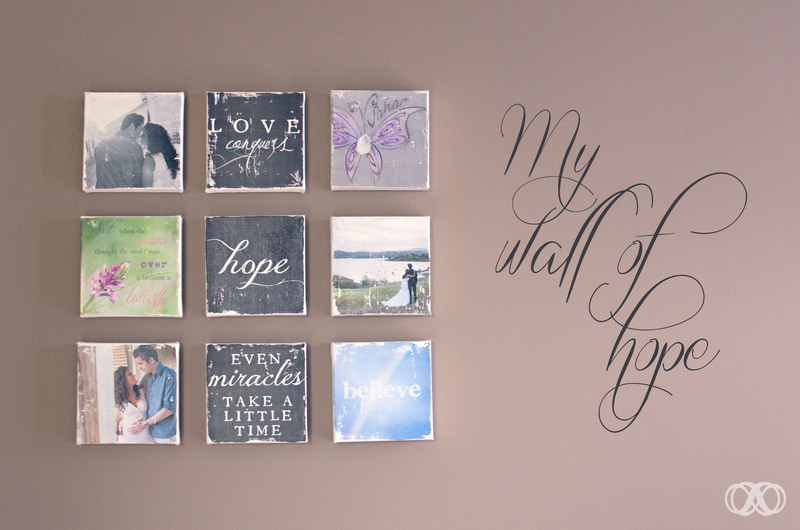 This little space at home has become my wall of hope. A space where I can go and dream while I watch these beautiful images. A space where I am reminded to believe and to keep our hopes and dreams alive. A space where I am reminded that I have to be strong and brave, that I have to trust that a better time will come our way. We fell in madly in love, and realized we are each other’s soul mates We got married. We shared the desire to have a family, and then we had a wonderful baby. Lightning struck, and we lost our sweet Sahar. We grew even more towards each other. Our love grew even stronger, even firmer. Our love for Sahar tied us together in an unbreakable bond. A picture of a sweet embrace. A beautiful quote holding nothing but truth. A butterfly that represents our daughter. Our firstborn. A caterpillar, that goes through an incredible transformation to miraculously wake up in the form of a beautiful butterfly. A reminder that we can get there too. Hope. That short, four lettered word that holds so much meaning inside, so much strength. It helps us move forward. A picture of us at our wedding, swooning over the beautiful scene in front of us, dreaming of our future together. I remember what I felt in that moment, I remember what I thought. Those dreams are still mine. Those dreams prevailed. A picture of our pre-wedding shoot. Frank’s hand resting on my belly. Even though we weren’t even trying at the time, this picture transmits the love we feel for each other, the desire we feel to have a family. 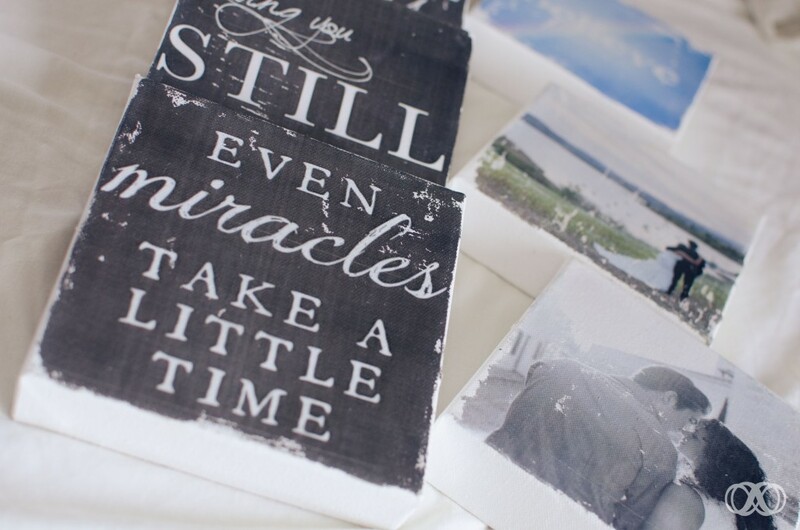 A reminder, that miracles take time. A reminder, that miracles happen. A reminder, that they can happen to us too. A reminder, to be patient. A picture of the rainbow that appeared the day we came home from the hospital, empty handed and broken hearted. A sign from our daughter. A message from her to us, telling us that everything would be okay. A reminder, that we should believe, that we should never ever give up. If you’ve gone through the devastating pain of loss, and you’re left behind empty handed, creating a space where you can dream of happy things might be very healing to you. I know it is to me. It keeps my dreams alive during the days were my mind crawls back into that dark place. It reminds me of all the blessings I’ve had and still have in my life, and the blessings that may someday come our way.